One of my photos of the band Whale has been featured in a Swedish TV show called "Stjärnor hos Babben". 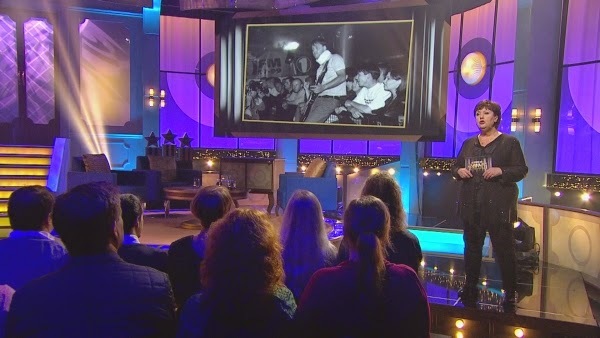 They had the former Whale guitarist Henrik Schyffert on the show, and the host, Babben Larsson, wanted to use one of my pictures of him in the programme. The picture was shown behind her on a screen, as she performed a stand-up routine, making a joke about Henrik being forced to wear a supporting collar on stage, due to earlier stage diving. In my concert photo, he's shown wearing a neck brace playing guitar. If I remember rightly, he tore it off for the final song, so I think it was purely theatrical. It's great to know that this photo has found a new audience on Swedish TV. Thank you to Christofer Psilander for getting in touch with this opportunity. You can see my library of concert photographs here, including Oasis and Radiohead and 90s indie greats Kenickie, My Life Story, and of course Whale. These photos were mostly shot on film and scanned from negatives. You can also see my library of travel photos here, including a new gallery from Istanbul, uploaded last week. My gallery from Spain has also been updated with photos from Seville. I'm steadily expanding my travel photography library, with a few new countries and cities lined up. As well as this TV programme, my photos have been used in books, magazines, brochures, museum exhibitions and DVD documentaries. If you'd like to use any of my photos (including reposting them on other websites), please contact me here in the first instance. I'm continuing to share my music online and write about my experiences recording it, but if you don't follow me on Twitter you might have missed these updates. My article Adventures in Modern Recording (hat-tip to Buggles for the title) outlines how I got started with recording, and how I'm using Sony ACID and the Alesis io4 in my home studio set-up. I've uploaded two new pieces of music. The first of these is Material World. This piece is built around sound effects from the street and inside the home, including ice in a glass used as a shaker, a bus, and a CD tray. Puzzle fiends might enjoy identifying the sounds, but don’t ask me for answers: some of them I’m not quite sure about myself. I dipped into my sample library for sound effects and loops to build this short abstract piece on. The bass part (used sparsely) is a backwards recording of the dying moments of a cassette that snapped while I was recording it to MP3 for the iPod. I like the way the end of this track leads into the next track, whatever it turns out to be (in an era of shuffle and playlisting). There is quite a lot of precedent for using sound effects in recordings, including the Art of Noise, Pink Floyd and the Shangri-Las (who all used a motorbike, as I have) and Pet Shop Boys who used street sounds to make a cinematic backdrop for West End Girls, but this track relies almost entirely on found sounds. I didn’t set out to create something specific, but this has ended up sounding heavily influenced by the Art of Noise. The second piece I've published is Space to Think, recorded using a Korg Kaossilator and some atmospheric sound effects from NASA. I wrote a review of the Korg Kaossilator, and how it compares to the Mute Synth II, which I tested out briefly before Christmas. Find out more about my music and home recording here. Let me know if you have any feedback on the music. One of the reasons for sharing it is to help me to refine it and see what resonates with others.